Guess what?? Music helps to improve your productivity…well, usually. Personally, there are times when I am working when I need absolute quiet. An example would be if I am doing something business-y and/or financial. I think that is because I am artsy by trade. If I am painting, I’m all ears for music. I think the same typically goes for whatever skill that you excel at. Some people listen to music while they read. Others can do their taxes while listening to music. If you haven’t considered listening to music while you work, check out the infographic at the bottom of this article to see some facts about how it might help your productivity. Music is a wonderful addition to any experience involving repetitive tasks. According to Jacki Hollywood Brown, of Unclutterer.com, “If you have a project you have been putting off for some time or if your task involves repetitive work…turn up the volume and listen to your favourite music to get you motivated.” Some repetitive activities to consider could be doing dishes, folding laundry, cutting coupons–well, really anything domestic. Other tasks that could benefit from music include sorting and organizing receipts, doing a product inventory count, grading papers, installing air conditioners, driving a truck, charting patient records and counting sheep or cracks in the sidewalk. In the following parts of this series, we will explore how music closely effects artist Joey Salamon and we will hear from an expert in music, Dr. James Gerber, Music Associate at All Saint’s Episcopal Church in Phoenix. Until then, I leave you with this site where you will find 226 free tracks to help your productivity. First of all, how AWESOME is this infographic? It really puts the highest and lowest points on earth in perspective. Can you believe how high Mount Everest is compared to Cirrus clouds? The Titanic is located much lower than the Grand Canyon. Happy Valentine’s Day! We hope you can agree there is more to being in love than flowers and chocolates. Take a look at this thoughtful infographic that talks about the science behind our emotions and why love can be such a strong feeling. We came across this great infographic the other day and thought it would be great to share since we are on fire for all things STEAM. 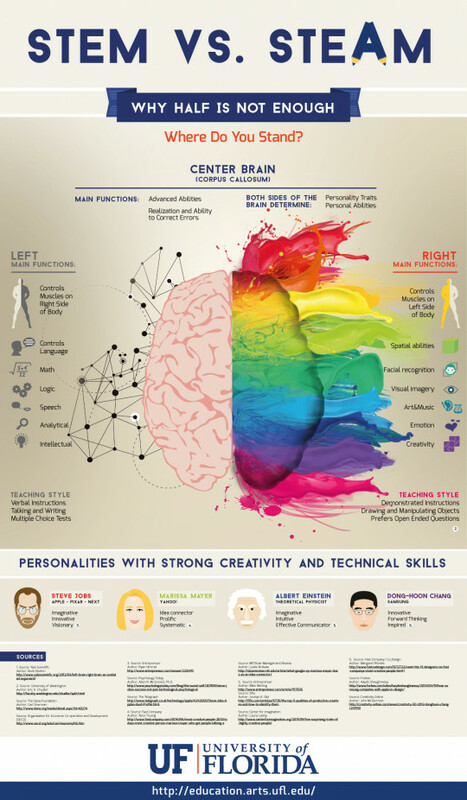 Are you more left-brain or right-brain? A little bit of both? Looking for more creativity to add to your Analytical? That’s what we love to do!